Have your kids hold onto their seats. 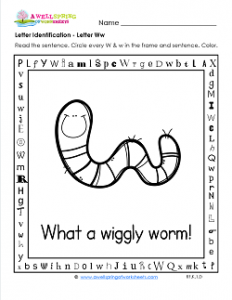 They don’t want to be wiggly worms like the fella on this letter identification worksheet for the letter w. He just wiggles all around. Lucky for me I got a still picture of him just by sheer luck. I was so happy I framed it so your kids could share in his cuteness. Have your kids circle every w, uppercase and lowercase, in the frame and the caption I gave my wiggly friend, “What a wiggly worm!” If you count them you’ll come up with 15 w’s all together – 12 in the frame (3 on each side) and three in the sentence. Don’t forget to find the hidden sight word. It’s the word “am” across the top of the frame.